South Korea has become a dynamic and lively country, providing global leadership in numerous areas, but it is situated in a complicated region and faces serious challenges in dealing with its neighbors. The sinking of the 1,200-ton corvette Cheonan on March 26, resulting in the deaths of 46 sailors, is a ready reminder of the instability of the region, especially the unpredictability of North Korea, which, according to international investigators, launched the torpedo that sank this modern warship from one of its midget submarines. Such a blatant military assault should not go unpunished, but finding the appropriate response is difficult, as no one wants to escalate tensions on the Korean peninsula. During the administrations of Presidents Kim Dae Jung (1998-2003) and Roh Moo Hyun (2003-08), South Korea’s “Sunshine Policy” was designed to promote economic exchange with North Korea to reduce tensions. While President Lee Myung Bak has shown a less friendly face toward the North, he has allowed some economic activities between the two Koreas to continue. But in response to the sinking of the Cheonan, President Lee has stopped nearly all trade with North Korea, prohibited North Korean ships from using South Korean shipping channels, and considered ramping up broadcasting across the demilitarized zone. South Korea and the United States had sought a strong Security Council response, but China and Russia blocked that effort, leaving many on both sides to feel that this incident is not heading toward a satisfactory conclusion. Given the dangers of escalation, talking is almost always better than killing, and efforts must continue to resume dialogue between the two Koreas as well as the Six Party Talks, which also include the United States, China, Japan, and Russia. The ultimate resolution of this matter should be designed to promote a more stable regime in the Yellow (West) Sea so that future military confrontations are less likely, and should include a North Korean apology for the attack on the Cheonan as well as compensation for the deaths of the South Korean sailors. But how can discussions begin to produce such results? The Cheonan was sunk near Baengnyeong Island, an 18-square-mile (46-square-kilometers) South Korean island situated less than 10 miles (16 kilometers) from the North Korean coast in the Yellow (West) Sea (and more than 100 miles, or 160 kilometers, from the South Korean mainland). It is one of five small South Korean islands that hug the North Korean coast west of Incheon. North Korea does not challenge South Korea’s sovereignty over these islets, but it does question the validity of the maritime boundary of the Northern Limit Line (NLL), which was drawn on August 30, 1953, by U.S. General Mark Clark, the United Nations Commander at the end of the Korean War. General Clark drew this line to stop South Korean vessels and planes from navigating north of this line. The line was never discussed with North Korea, and was never accepted or acknowledged by the North, which has repeatedly protested against it. The Northern Limit Line divides South Korea’s five coastal islets and the North Korean coast, and blocks North Korea’s access to the fishing resources in this part of the Yellow (West) Sea, particularly the valuable blue crabs, which are plentiful between May 1 and July 15 each year. North Korea has always wanted to increase its share of the catch, because the crabs can be exported for hard cash to China and Japan. Chinese ships also come into this region to illegally harvest the blue crabs. Military confrontations over the crabs occurred on June 15, 1999, when thirty North Korean sailors were killed, and on June 29, 2002, when a North Korean vessel sank a South Korean patrol boat, in which five South Korean sailors were killed and a North Korean vessel was set aflame. More recently, on November 10, 2009, naval vessels from the two Koreas exchanged fire, reportedly causing damage to a North Korean patrol ship, in an incident known as the Battle of Deacheong. Some even suggest that the sinking of the Cheonon might have been a reprisal for that confrontation. The Northern Limit Line has been useful as a line of military control. 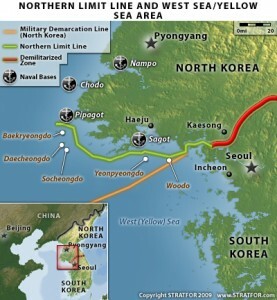 But if the two Koreas were to be regarded as independent countries (rather than as two halves of a temporarily divided country), then this Line would not be viewed as a legitimate maritime boundary under the “equitable principles” that govern boundaries, because it denies North Korea access to adjacent sea areas. In blocking such access, the NLL is contrary to the principle of “non-encroachment” and to recent precedents because it gives the small islands equal capacity to generate maritime zones as the continental land mass of the North Korean coast. In case after case, tribunals have ruled that small islands should have limited capacity to affect a maritime boundary, especially when their effect dramatically changes the result that would exist in their absence. The most recent decision to reach such conclusion was issued last summer by the International Court of Justice regarding the maritime boundary between Ukraine and Romania in the Black Sea. Ukraine argued that its tiny Serpents’ Island should be considered in the drawing of the boundary but the Court disagreed. It recognized a territorial sea “enclave” around Serpents’ Island but otherwise drew the boundary as if the islet did not exist at all. A similar result was reached in one of the first maritime boundary cases—between France and the United Kingdom in the English Channel in the late 1970s—where the UK islands of Jersey and Guernsey (which are nestled next to the French coast) were given territorial sea enclaves, but were otherwise ignored in the delimitation. Almost all other decisions have reached similar results, with small islands having a limited or reduced impact on the maritime boundary, even if they had substantial populations living on them. In September 1999, North Korea unilaterally announced that it had redrawn the maritime boundary in this part of the Yellow (West) Sea to divide the waters between the two Koreas equally, without regard to the five South Korean islands. In response, President Roh sought to promote a joint fishery zone in this region during the final months of his administration. It is hard for any political leader to take action that is perceived as making a territorial concession, especially one that may create additional security concerns. But perhaps a way could be found to address this dispute that also strengthens South Korean security, by allowing for increased North Korean fishing while reducing the military assets facing each other in this region. South Korea has legitimate concerns that North Koreans might overfish the crabs, causing substantial harm to future harvests. 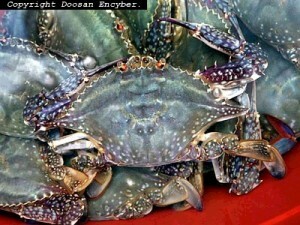 Therefore, careful regulation would be required to limit the number of vessels going after the crabs. Other environmental issues also require joint management, including the spotted seals that are threatened by loss of habitat and human activities. Because of these complexities, it would be best to start with a closely monitored joint fishery zone to promote confidence, with serious discussions regarding a formal maritime delimitation to start later, after the two Koreas have had a period of successful cooperation. The five South Korean islets are entitled to a territorial sea, but because they are so close to North Korea, it might be appropriate to consider a territorial sea around them that would be less than 12 nautical miles, particularly on the northern side of the islets. Some have suggested a “fingers” approach, whereby North Korea would govern the maritime space extending between the South Korean isles, out to a median point between the continental coasts of the two Koreas. The final boundary must be determined through negotiations, focusing on the unique geography of this region and the security concerns of each country. Because the present stand-off is not in anyone’s interests, innovative thinking and constructive discussion are essential. Recommended citation: Jon Van Dyke, “The Maritime boundary between North & South Korea in the Yellow (West) Sea,” 38 North, U.S.-Korea Institute Johns Hopkins University School of Advanced International Studies, July 29, 2010. Online at: www.38north.org/?p=1232.